Bouncers has the perfect answer when you're in charge of the event planning and decision making on the activities. Bouncers has sports challenges and other great interactive attractions that will create fun for all ages. 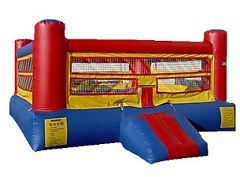 Browse the inflatable interactive game rentals below and click on the title or image for more information and make a reservation today! 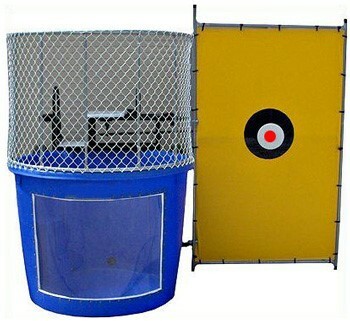 Dunk Tanks are a great tool for fundraising or other promotional opportunities where a little splash of the right person can be amazingly entertaining. Are you ready to rumble? This is a great party activity. Players enter the bouncey boxing ring with over-sized boxing gloves and head gear. Completely safe and lots of fun for all ages. 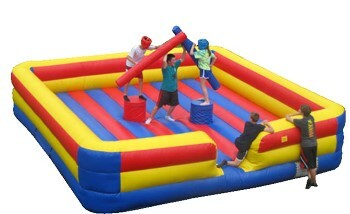 Player compete using soft foam padded jousting batons while perched atop small pedestals. 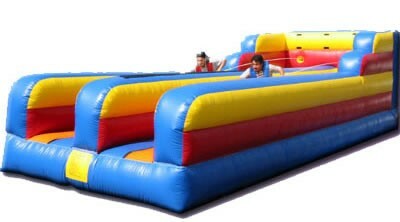 Each tries to knock the other off their pedestal while trying to keep their balance.Get fun for all ages. Great way to get everyone involved in the activities. 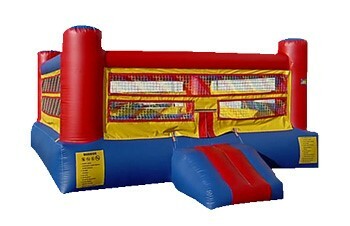 Two participants race down the inflatable raceway, stretching the bungee cords as far as they can, trying to place their marker further than their opponents, until…...BOING! They are safely rolled, bounced and blasted backward to the start.